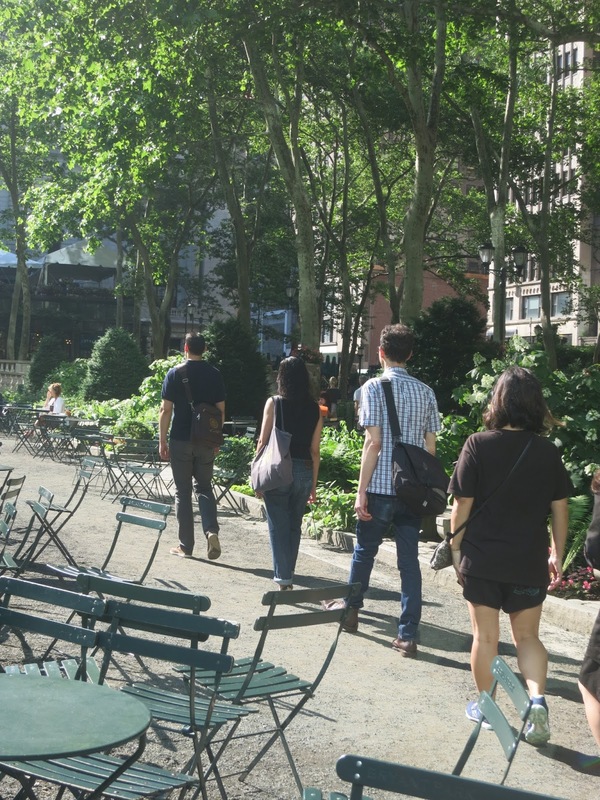 To celebrate the start or return of many Bryant Park summer programs, we asked our partners to write guest blog posts. This post comes from Qalvy Grainzvolt of the Shinnyo Center for Meditation and Well-Being, our partner for Wednesday morning's Walking Meditation. Walking and meditating, at the same time, is one of life’s original “multi-tasks.” The relationship between mind and body can be a peculiar one in that where our mind wanders and where our feet step can, at times, be very different places. Often we are thinking about something that happened in the past, or preparing ourselves by forecasting the future. The result being that we are not fully present to experience where we are at the present moment. But with a little new attention and awareness, walking in the city can become a safe and rejuvenating kind of meditation that can enrich your daily life. 1. Check-in with your surroundings - put down the smart phone. Begin by simply observing where you are and what is going on around you. Meditation has a lot to do with relationship. Taking the time to survey our surroundings, we begin to see how we relate to ourselves as well as the environment we are in at any given moment. Meditation does not encourage escape but rather a more profound way to relate and engage with the world around us. Walking Meditators take a walk around the Lawn. 2. Cultivate a baseline of calm amidst the chaos - take a minute or more to simply be still and be aware. Try gently closing the eyes (if you are in a safe environment to do so) and have a relationship with the sounds around you for a few minutes. If there is any one overpowering sound (a car horn, a screeching bus), see if you can focus on a sound that is quieter or more distant. For example, the sound of a bird twittering overhead may be fainter than the sound of the garbage truck zooming by, but relating our full attention to the bird’s tweet can allow us to have a new relationship with the same environment. We are not escaping the sound of the truck (or anything else) but discovering calm amidst the chaos. This is one way to cultivate the baseline with which we begin walking meditation. 3. Take a walk - we tend to spend much of our lives in a destination-driven manner. With walking meditation, try to spend more time on the quality of the journey rather than focusing on the destination or predicting. Final Tips: Feel the ground with each step. Breathe moderately-deep (unless there is a bus with fumes nearby!). Experience simply being present while walking. If the mind wanders, let the physical sensation of your breathing guide it back to the present. Be positive when your mind wanders and view this as an opportunity to see what undercurrent is flowing within and pulling at your attention. With greater awareness comes greater ability to cultivate a response, rather than surrender to a reaction in daily life. In a world of multi-tasking, being fully aware and present is a great step towards making the most of each and any given moment.